Donald Trump appears ready to declare a national emergency at our southern border. The only emergency there is the danger that no wall will be built, despite Trump’s promises to his supporters for the past 3 years that he would build a “beautiful wall”. Trump is elevating a personal political problem into a national crisis. But a much greater potential national emergency looms in our future: the possibility that Trump and the Republican Party will do damage to our democracy out of fear of the 2020 election. One of the most frightening developments in American politics has been the increasing disdain of significant portions of the Republican Party for basic democratic norms. An early highlight of Republican disregard for our normal democratic process was their refusal to consider President Obama’s appointment of Merrick Garland to the Supreme Court in March 2016. While Mitch McConnell is often linked personally with this unprecedented action, all 11 Republicans on the Judiciary Committee said they would ignore any Obama nominee. Then after the election, Republicans eliminated the filibuster for Supreme Court justices in 2017, enabling them to push through Trump’s nomination of Neil Gorsuch. The longer history of extreme partisan gerrymandering of state and federal election districts in Republican-dominated states after the 2010 census created disproportionate legislative majorities. In 2012, Democratic candidates for the House won 1.4 million more votes than Republicans, but Republicans took the House 234 to 201. At the same time, the Republican Party embarked on a nationwide effort to rig elections by disenfranchising voters more likely to vote for Democrats: minorities and the poor. Republican state legislatures have employed demands for special kinds of ID, restrictions on absentee and early voting, purging of voter rolls, and inadequate staffing of certain voting places to target typically Democratic voting groups. These two sets of anti-democratic strategies created Republican-dominated state legislatures, even where they received fewer votes than Democrats, as in North Carolina. In 2016, Republicans began to use these majorities to invalidate the results of election losses. After Democrat Roy Cooper won election as North Carolina’s Governor in 2016, Republicans in the state legislature convened a special session to transfer many of his powers to themselves. For example, the number of appointments that Cooper was allowed to make was cut from 1500 to 400. After the 2018 midterms, Republicans in the Wisconsin and Michigan legislatures stripped powers from newly elected Democratic governors. The Wisconsin state legislative races were so blatantly gerrymandered by Republicans that federal judges had overturned them, but they were still in place for the 2018 elections. In December, the Republican legislature voted to limit Governor-elect Tony Evers’ appointments, to restrict early voting, and to restrict the power of Josh Kaul, the Democrat elected as attorney general, and outgoing Governor Scott Walker signed the bills. In both the Wisconsin Senate and House, only one Republican legislator voted against these laws. Based on one of the most extreme gerrymanders in the country, Michigan’s legislature is dominated by Republicans, although the Democrats won more votes in 2014 and 2018. After losing all the statewide races in 2018, Republicans voted to limit the powers of the new Governor and Attorney General, and to redefine elements of the non-partisan citizens’ commission to oversee future redistricting, that had just been passed by over 60% of Michigan voters. The Promote the Vote ballot initiative allowing voter registration up to Election Day, that had passed 67% to 33%, was altered to add ID requirements. Again nearly all Republican legislators voted for these bills. The Republican Party has transformed itself into a political force that prioritizes its own power over the sanctity of electoral democracy. The authoritarian tendencies of Trump as President added to this rampant Republican electoral cheating threaten to create a national crisis. Trump has consistently disparaged the results of elections, even his own victory in 2016. He appointed an experienced vote suppressor, Kris Kobach, to oversee a futile federal effort to prove electoral fraud. Trump uses presidential power to promote his personal interests. He employed our armed forces on our southern border as a political stunt. 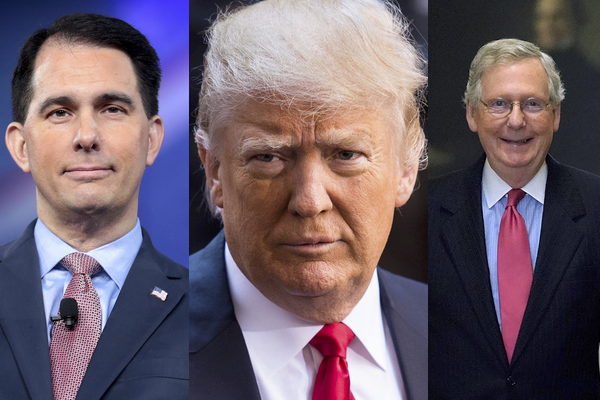 Although the shutdown that Trump gladly took credit for, until he started blaming the Democrats, is rejected by a majority of voters, Republican legislators have remained behind him. Now he is considering using the President’s emergency powers, when our elected Congress thwarts his will. The election of 2020 presents a critical dilemma for Trump. It may not be possible to indict a sitting president for the campaign finance violations for which Trump is currently an unindicted co-conspirator. If Trump wins in 2020, the statute of limitations of five years for such federal offenses will run out while he is in office. But if he loses, he may face prison time. The many other investigations of his political and business activities that have already begun or will be initiated by the Democratic House will add to his judicial peril. 2020 qualifies as a personal emergency for Trump. Would Trump’s core supporters accept a coup? Many evangelical leaders and voters believe Trump to be the modern incarnation of King Cyrus of Persia, a nonbeliever chosen by God to accomplish the goals of the faithful. Some of Trump’s most prominent evangelical supporters openly long for a “king” to rule America. A criminal President, who will do anything to serve his ego and self-interest, threatened with jail. A party willing to fix elections and ignore electoral results that don’t go their way. Cheerleaders on the most popular media network who ignore inconvenient news. A howling base of supporters that believes Trump’s opponents are traitors who belong in jail. All the elements are in place for a presidential coup against our constitutional democracy. Paul Krugman just wrote about a possible reaction to looming defeat in 2020: “if you aren’t scared about how a cornered Trump might lash out, you haven’t been paying attention.” It will be too late in November 2020 to prevent a national emergency. We must pay attention now.